We recently watched The Great Dictator, Charles Chaplin’s slap at Adolf Hitler and Benito Mussolini, a movie that evoked the question of whether that subject matter could be treated appropriately in a humorous setting. Although the film was well received, Chaplin himself later said that if he had been aware in 1939 of the full scope of fascist atrocities in Europe, he would not have made it. The question of depicting Nazi atrocities in a comic milieu without minimizing the crimes themselves also arose with respect to Life is Beautiful (La vita é bella), the 1997 quadruple Oscar winner in which a Jewish book-shop owner and his young son are caught up in the Holocaust in Italy and sent to a death camp, and the father sacrifices his life in order to shield his boy. The unlikely mix of comedy and Nazi brutality also was the basis for The Secret of Santa Vittoria, a 1969 film based on Robert Crichton’s novel by the same name. The film, which was directed by Stanley Kramer, starred Anthony Quinn, Anna Magnani, Virna Lisi, Hardy Kruger, and Sergio Franchi. The people of Santa Vittoria transfer the wine to its hiding place. This story takes place in the summer of 1943. The government of Benito Mussolini has collapsed and the German army is in the process of occupying most of Italy. The people of Santa Vittoria learn that their town is soon to fall under German rule and one result will be that the Germans will confiscate more than a million bottles of wine that have been produced by the local co-operative. In the power vacuum that ensues because the local fascist government has been discredited and some officials arrested, the town fool, Italo Bombolini (Quinn), is declared mayor by acclamation. Under the guidance of a more sober character named Tufa, played by the tenor, Sergio Franchi, Bombolini devises a scheme to hide all but 300,000 bottles of the wine in tunnels that date from the age of the Roman Empire. When a small contingent of German army personnel, under the command of Capt. Sepp Von Prum (Kruger), take charge of the town, a cat-and-mouse game begins in which Bombolini patronizes the Germans but insists that the wine in the storage cavern is all there is. Kruger is under pressure from the SS to find the wine the Germans are sure is hidden nearby, but he eventually convinces the SS commander that the townspeople are telling the truth. In his heart of hearts, however, Kruger knows better, and as he and his men are about to vacate the town, there is a tense episode in which, in the presence of the whole village, he puts a handgun to Bombolini’s head and threatens to fire if someone doesn’t tell him what he wants to know. He is met with grim silence and, because he really doesn’t have the steel will expected of Hitler’s cohorts, leaves without further incident. Magnani plays Bombolini’s wife, Rosa, the stereotypical Italian firebrand who badgers her husband about his indolence and drunkenness. Virna Lisi appears as a peripheral character, Caterina Malatesta, who is a love interest of Tufa and the object of Kruger’s rather courtly advances. The Secret of Santa Vittoria was nominated for Academy Awards for film editing and best musical score (Ernest Gold); it won the Golden Globe Award as best motion picture comedy and was nominated for best director, best actor in a comedy (Quinn), best actress in a comedy (Magnani), best original score and best original song (“Stay,” which was written by Gold and Norman Gimbel). This movie wasn’t nearly as popular as Crichton’s novel, and it was a loser at the box office. It is in many ways superficial, implausible, and obvious. And yet, for the price of an Amazon rental fee, it is worth watching for its entertainment value, including the arch but earthy performances by Quinn and Magnani and the charm of blue-eyed Hardy Kruger. 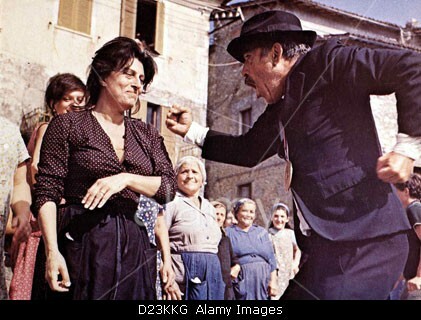 The movie, entirely an American production, was shot in Anticoli Corrado in the province of Rome, with hundreds of local residents acting as extras. 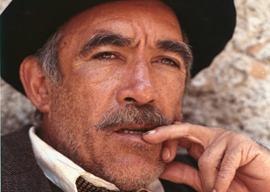 Paolino I did see the movie with Anthony Quinn and totally enjoyed it. I’ve not seen the film or read the book, but as soon as I read your description of the film as “superficial, implausible, and obvious,” I decided to find and watch it. It certainly beats the current “superficial, implausible, and obvious” comedy of American politics. Besides, Anna Magnani has better hair than Trump, and I haven’t seen courtly behavior in some time. I imagine some people would object to the way the captain is portrayed, but there must have been a variety of personalities among those who served in the German army at that time, including a few with good manners.